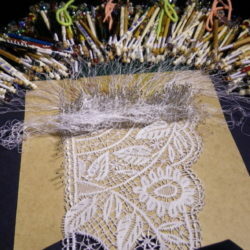 Designer, maker and teacher of handmade traditional and contemporary bobbin lace. Lace has traditionally been a symbol of wealth and worn to make the wearer feel beautiful. It was created by poorly paid workers for the rich. Today this has shifted and now the engagement and participation is more important than the finished product, so lace still enriches lives and enthralls all practitioners. Specialises in traditional Bedfordshire and Bucks Point, with particular interest in 19th century Thomas Lester designs. Using traditional techniques to stretch boundaries in contemporary application and appearance.